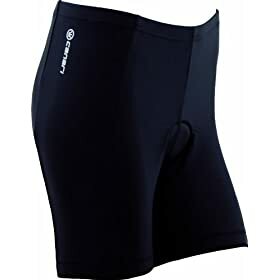 Canari Womens Velo Cycle Shorts ; The Canari Velocity women's cycle short is made from 83% Nylon / 17% Spandex, matte finish fabric for excellent support, comfort and protection. The 7 inseam falls around mid-thigh so it is not too long and not too short. 6 panel anatomical design is built for your body and being on a bike. An anatomical molded chamois with a micro-soft surface and seamless construction. The inner foam layer is engineered for comfort, breathability and moisture management.